This is a Penang version of Char Koay Teow which should definitely be enjoyed when in Malaysia. The thin flat rice noodles are stir-fried in individual portions in a very hot pan or wok to get an optimised flavour – what the Cantonese call ”wok-hei” (the breath of the wok). The Penang Char Koay Teow is different from that of the rest of Malaysia or Singapore in that it doesn’t use sweet sauce, each portion is fried separately and the noodles are thinner. Traditionally duck eggs are used. Divide the ingredients into four equal portions and fry each individual portion separately. Use a hot frying pan or wok and high heat. Bring a pot of water to a boil with water sufficient to cover all the dried koay teow. Put the koay teow into the boiling water and turn off the heat before the water boils again. Leave aside. Just before frying, strain the koay teow using a colander and rinse in cold water. Fresh flat rice noodles comes in sheets which are stacked and cut into strips. Separate the strips before frying. If using dried flat rice noodles, boil enough water to cover all the dried noodles. Put the noodles into the boiling water and turn off the heat before the water boils again. Leave aside. Just before frying, strain the noodles using a colander and rinse in cold water. Heat a pan or wok and add the cooking oil when the pan is hot. Spread the oil over the pan or wok, add the garlic, stir, add the prawns, and fry till cooked. Add the chili paste and stir quickly. Now add the noodles and 2 tsp of the light soy sauce. Stir well for about 1 minute. Add about 1 tablespoon of salted water. Include the bean sprouts and continue to stir fry for about 1-2 minutes. Add the sliced sausages and mix well with the other ingredients. Add another tablespoon of salted water and stir well. Make a well in the middle of the wok by moving the contents to the sides. Add 1 tsp of oil and break in an egg. Add 1 tsp of light soy sauce and ground pepper. Scramble the egg until half cooked, then mix it with the noodles. Add the chives, cockles and fried lard cube and give a good final stir before turning off the fire. If the noodles are stuck to the pan, cover the pan and let the steam soften and separate the bits that are stuck. Looking through the list of ingredients I notice one very essential ingredient missing, fish sauce. 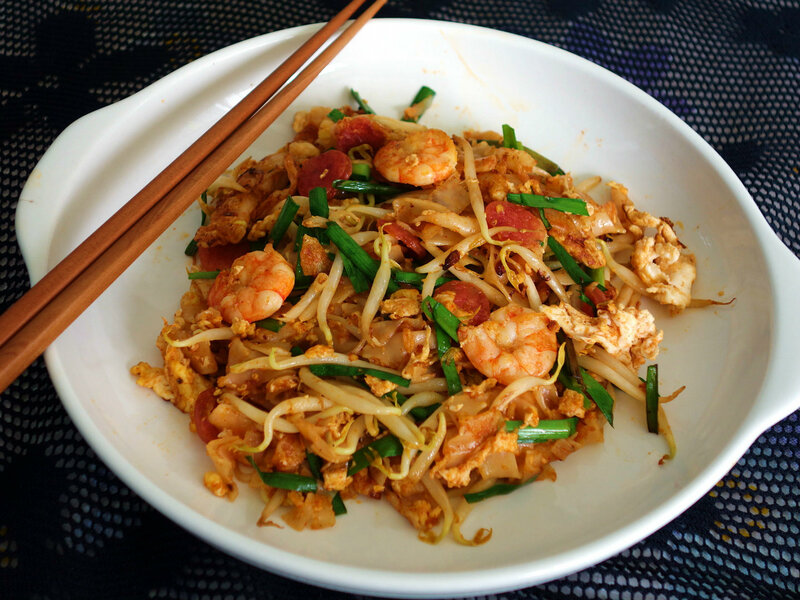 Char Koay Teow is Teo Chew in origin and as we all know fish sauce is a must in Teo Chew dishes. My two cents input.